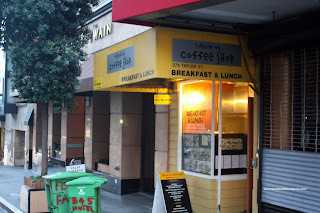 All along, we were planning on paying Dottie's True Blue Cafe for some breakfast during our time in San Francisco. After all, it's only located 1/2 a block from the hotel. But for the love of everything, there was a lineup that looked to be 1 hour long. You know how much I love lineups. Scratch that plan. So off we went in search of other morning eats. Strolling around downtown, while dodging smeared dog poop all over the sidewalks, we ended up at Taylor Street Cafe. Well... with the help of the internet, specifically Yelp. Essentially a dive, it did not have a lineup and there were some items on the menu that looked a bit different from the ordinary. C'mon, breakfast is not rocket science. Anything a bit different catches my attention. You can get bacon and eggs anywhere. We sat down at a table for 2 in the spatially-challenged dining room and started to strategize as what to order. No duplicates! So, as a baseline of sorts, we got a typical breakfast in the Meatlover's. 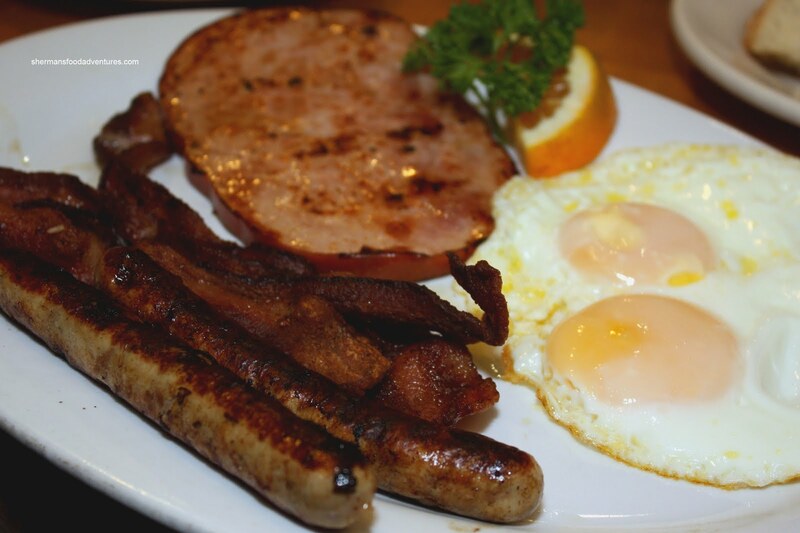 2 eggs, ham steak, bacon, chicken apple sausage ($1 more) and toast, pretty standard fare. Not much to complain about here, ample meat prepared correctly and the eggs were nicely runny, if not really sunny-side up (cooked with a lid on, thus the appearance). 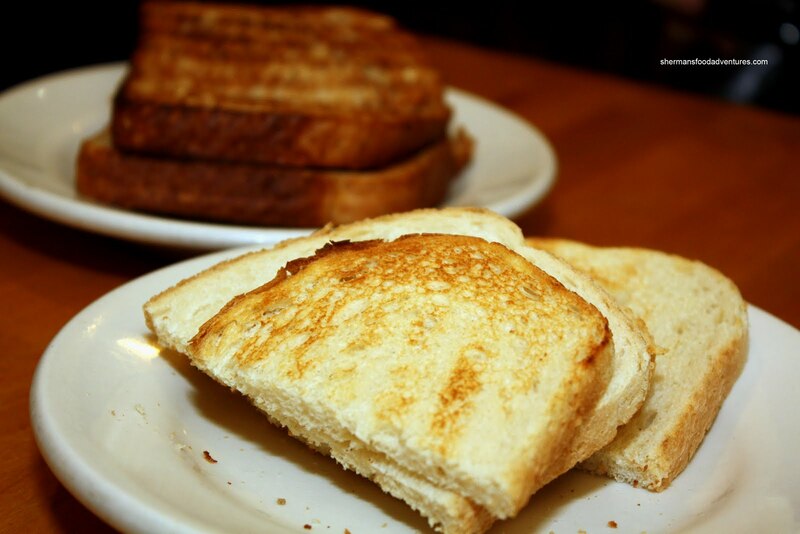 I liked how the toast was not pre-buttered, which allowed me to be conservative with it. Kim ended up ordering something different and pricey in the Sailor's Hash. 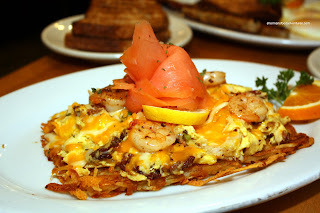 A unique combination of shrimp, crab, smoked salmon, scrambled eggs, cheddar, bacon and peppers atop a piece of crispy hashbrown, this was not a typical hash. 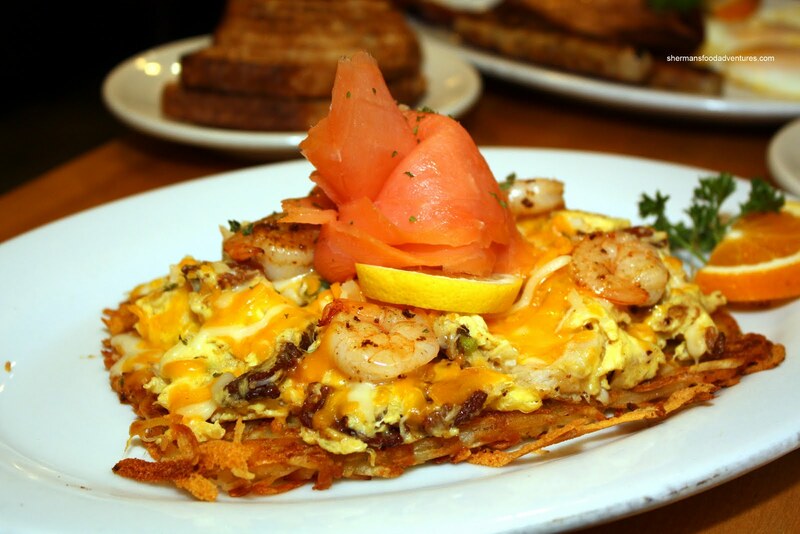 It was not a hash in the normal sense since it really was a scramble on top of hashbrowns. But I liked it. The eggs were not too overcooked while the ample ingredients gave a mix of flavours. Not sure what flavour it was, it was pleasing though. The crispy hashbrown provided a nice textural contrast. Although this was a solid dish with good components, the price tag of $13.00 was a bit high considering the venue and location. With that being said, the eats here are solid, if not good. Staff are friendly and its got this homey, dive feeling about it. Yet, you can practically eat anywhere for $13.00, so I'm not sure if Taylor Street Coffee Shop would necessarily be considered a cheap place for breakfast. Yep, $13 is definitely a bit high for me for breakfast. Shucks, I would even shudder at that price for lunch. Holly, yah you could eat almost anything for that price.